Chinese Empire Investing Billions in the UK, Good News or Trojan Horse? 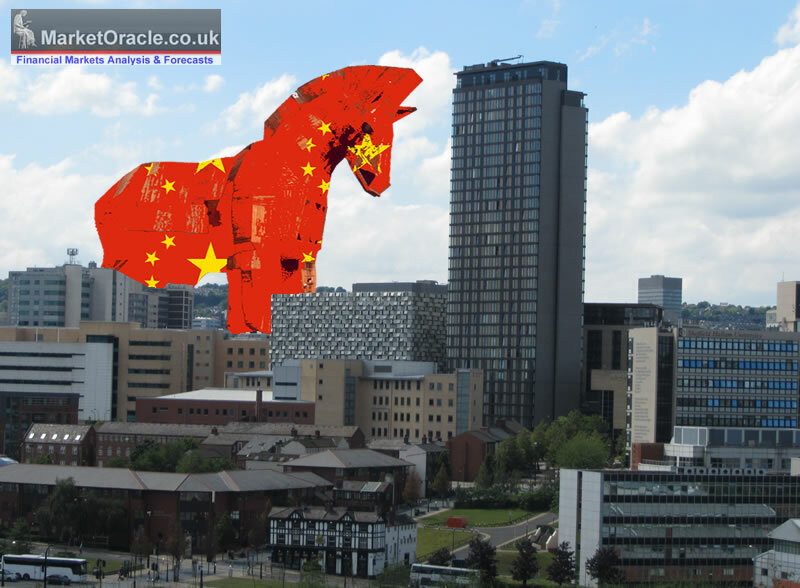 China Empire Investing Billions in the UK, £1 billion in Sheffield Alone, Good or Trojan Horse? Sheffield's Labour run city council has been in celebratory mood since signing a deal in Chengdu for China to invest £1 billion pound in building projects across the city, apparently most will be city centre apartment blocks. Sheffield's Labour Council Leader declared "This is the biggest Chinese investment deal to be made by a UK city outside of London. And perhaps more importantly it is first deal of its kind to be made by a UK city, this is a real partnership." The £1 billion is being funneled into the UK in stages through a Chinese company that apparently itself only has a market capitalisation of about £500 million and its financials show is heavily indebted, pays no tax and is currently making a loss, though of course where China is concerned the real source of funding tends to be the big behind the scenes player, the Chinese state itself! However, no one is asking the key question Why? Are we to assume the communist party officials in Beijing are through the goodness of their hearts giving the green light to invest not just £1 billion in Sheffield but annually many billions across UK cities to buy up land and property for redevelopment into mainly apartment blocks. And apparently this will be a 60 year project for Sheffield! Why does China need 60 years to build apartment blocks when it is been busy putting up whole cities within 5 years, hint Hong Kong was a 160 year British Empire project. So is this really good news? or are we looking at a Chinese Trojan Horse? First a lesson in economic fundamentals because one thing socialist councilors tend to lack is any real understanding of economic fundamentals and that is that Britain is structurally weak and that weakness is blatantly apparent when looking at Britain's current account deficit that is currently running at -£32.6 billion per quarter that converts into an annual deficit of -£128 billion, which is the difference between that which Britain buys from abroad (imports) against that which Britain sells abroad (exports). Conversely, on the other side of the equation are the major exporting surplus nations such as China and Germany that have a huge current account surplus against the UK, as most of the both useful and useless stuff that Brit's tend to buy in the shops tends to be made in China. So Britain has a serious problem because basically it has a current account black hole of -£120 billion. Whilst China is getting richer each year as a consequence of selling mostly junk to British shoppers in exchange for foreign currency (sterling). However, this current account imbalance causes China a potential problem because Britain is selling £120 billion of excess Pounds to buy goods in foreign currencies such as the Chinese Yuan to pay for the net imports. Which would mean that sterling should be continuously falling against the Chinese Yuan and thus the prices of chinese goods in the shops should have soared over the past decade and thus Brit's today should no longer be able to afford over priced Chinese goods in the shops whilst British goods would become cheaper in China, and so the current account deficit should have returned towards balance. However, this has NOT happened because China does not want to lose its £120 billion economic net subsidy from the UK as it effectively amounts to Britain employing millions of workers in China to produce goods and build infrastructure in China rather than employing workers in the UK, which is a consequence of globalisation. So what has China done instead? It has manipulated its exchange rate LOWER, how? By BUYING sterling assets, buy INVESTING in the UK. So NO China is NOT investing the UK out of the goodness of its heart but it is a necessary accounting process so as to maintain China's huge current account surplus against the UK. Now you are never going to hear that on the likes of BBC Look North! But that's only the tip of the China ice-berg! It gets a lot worse as after having ejected an inept David Cameron who blindly walked into the BrExit brick wall. Theresa May's fresh eyes have apparently been opened to the emerging China Threat as China looks set to launch a new aircraft carrier every other year enabling China to flex its muscles in the South China Sea and beyond. Which is why the UK government has postponed its decision to have China build a nuclear bomb, I mean a nuclear power station on the Somerset coast (30% stake), the first of several planned nuclear reactors across Britain amongst other key infrastructure projects such as telecommunications and the power grid. Apparently it had not dawned on the likes of MI5 that China would literally have built in a kill switch to ensure Britain a decade or so down the road would become subservient to the emerging super power, or rather Axis powers of Russia and China that just over a decade from now would militarily out match the US and its allies such as Britain, heralding a new world order, and thus threats of protracted series of wars fought across the world towards which the Chinese empire will have successfully neutralised many of America's allies through infrastructure investment kill switches and infiltration. Jobs creation is one of the trumpet calls welcoming Chinese investment into cites such as Sheffield, however what no one is asking jobs created for whom? British workers or thousands of Chinese workers brought over on work visa's? An economic invasion, for that is what the immigration statistics suggest is underway that apparently no one in the mainstream press is picking up on. The latest ONS immigration statistics show that outside of the EU the greatest number of net migrants into the UK for permanent settlement are from CHINA as the following table illustrates which implies a stealth colonisation of Britain is in progress as part of the emerging Chinese economic and military super powers great game that few in the west are awake to the consequences of as the Chinese totalitarian state looks set to become increasingly more aggressive and demanding. So it won't be long before China starts to flex its muscles directly in the UK through attempts to stifle criticism of the actions of the Chinese totalitarian state and the great game of stealth colonisation it is playing right across the world as China carves out a Chinese Empire. Net immigration +327k, EU +180k, Outside EU +190k, British citizens -43k. Note net outside EU immigration now exceeds EU immigration. Nationality information on individuals that are subject to immigration controls, coming from non-EU countries. The immigration statistics show that China has now over taken India as the greatest source of outside of EU migration into the UK, with 92kvisa's granted for settlement, which compares to 84k for Indians and 34k for Americans. This goes hand in hand with increased Chinese investment so as to create the demand for tens of thousands of work permit visas for Chinese citizens. The bottom line is that Chinese investment into the UK is NOT good for Britain's future, for instance Britain would be far better served if the £120 billion extra spent annually employing millions of workers in China was spent on creating jobs for UK citizens. REAL investment is in building factories and businesses NOT Buying up property and land to develop into apartment blocks and amenities for thousands of imported chinese workers, that's called COLONISATION! Therefore Chinese investment in Sheffield, and the rest of the UK really IS a TROJAN HORSE that virtually all of our short-termist, only focused on the next election politicians remain completely blind to the long-term consequences of. What else should one expect from local Labour councilors in cities such as Sheffield awed by the big numbers, whilst completely blind to the great game being played by the new emerging Chinese Empire. Though the China threat to Britain to date is nothing as compared to that which China poses to asian and African nations, as China has been buying up huge tracts of African lands at deep discounts from corrupt government officials and politicians that seeks to replicate the Chinese totalitarian ideology by stifling local dissent as China forges its own Imperial Empire that today only the nations of the South China sea truly understand the consequences of as each year China declares ownership of new territories following the building of artificial islands on corral reefs and then engages in battles in the shipping lanes of other nations such as Japan and the Philippines. 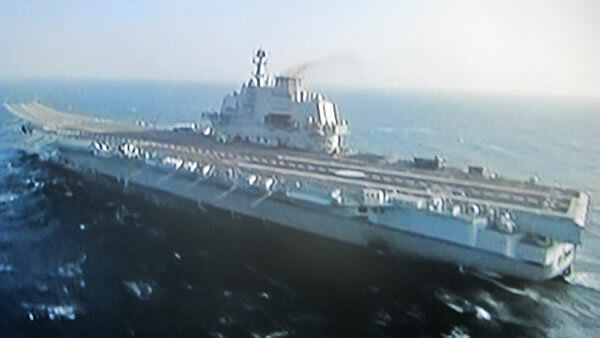 The South China sea confrontations have already triggered Japan to seek to rearm after 60 years of being demilitarised. 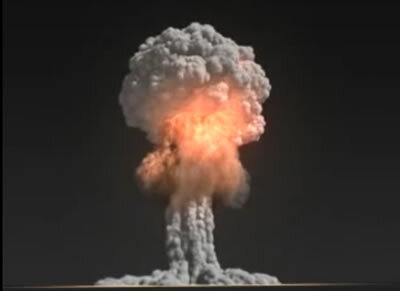 In fact Japan's earlier technological investments with an opening China is one of the primary reasons why China has developed so fast, which the Japanese surely must now be regretting and realise as being the mother of all mistakes. 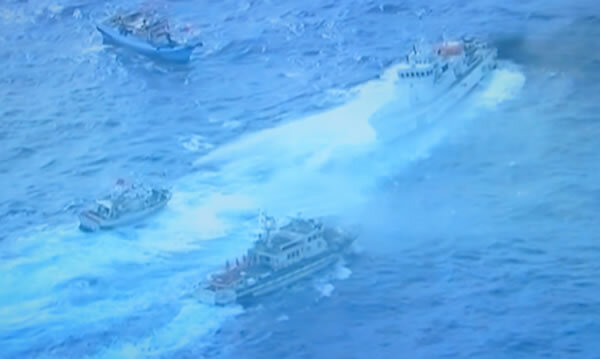 A war is definitely brewing in the South China sea. So what happens in a decade or so when China parks an aircraft carrier or two off the North Sea whilst it builds an artificial Island so as to claim territorial sovereignty, will the UK then find itself in a similar situation to the dozen or so nations today in the South China sea? After China will probably have approaching 3 million loyal chinese citizens stationed in the UK by then, ready to do its bidding. Don't forget China IS a TOTALITARIAN STATE! And Britain WILL pay a heavy perhaps fatal price for doing deals with a TOTALITARIAN STATE! As BrExit from the emerging European Superstate morphs into Britain becoming subservient to the emerging Chinese Empire. At least today Theresa May has one eye half open, lets hope the eyes of others also soon start to flicker open before we let naive city councilors do more deals such as that which Sheffield has done! The bottom line is that China has been engaged in and winning an economic war against the west for over a decade! 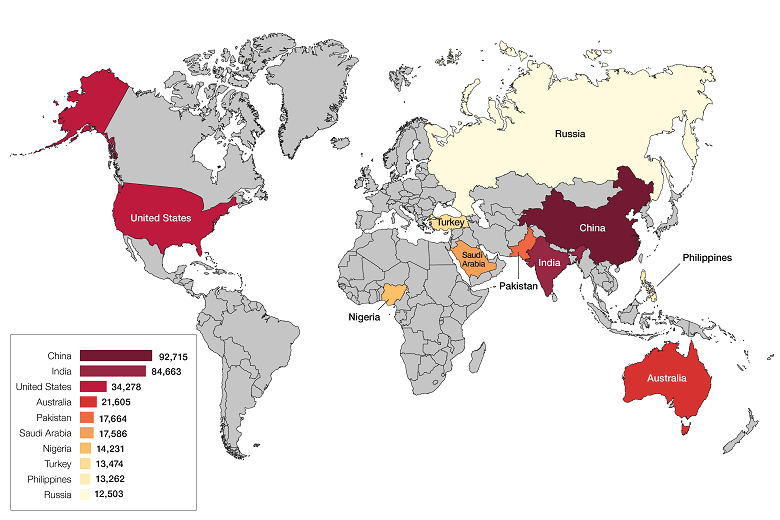 All whilst it's military might catches up with the U.S. which it is likely to do so by a decades time. And today's 'investments' in western nuclear projects, cities, power grids, and telecom sectors are part of the strategy for when China seriously starts to flex its military muscle. Especially as it won't be China vs the West, but rather the China / Russia Axis vs the West in inevitable resource wars triggered by climate change. The latest news out of the UK economy is that the post BrExit economic collapse as illustrated by the Purchasing Managers Index that during July fell sharply to 48.3 (a reading below 50 implies economic contraction) which most academic economists that populate the mainstream press concluded heralded the start of a severe imminent downtrend, a recession early warning. At the end of the day sports is sports, and thus is just a taste of the freedom boost to come that will most significantly be felt in the economy, as all of the economic doom merchants in the pay of the establishment elite that populate the mainstream media will once more be found out to be badly wrong, as the British people and economy fired up by BrExit freedom of having taken back control will out do all of the establishments fear mongering as painted by the academics and political pundits and thus expect the UK economy to get a brexit boost rather than collapse, both from consumers going on a confidence inspired spending spree and from the export sector boosted by sterling's 12% devaluation, which has already been reflected by the stock markets strong performance when the fools that populate the financial press had penciled in a crash, collapse or worse! Similarly house prices instead of crashing by as much as 20% as many REMAIN doom merchants were warning of in the run up to the June 23rd vote, instead are accelerating higher as illustrated by the latest figures out of the Nationwide that show that house prices are now rising at their strongest rate for 2016, up 0.6% for August. Whilst the Halifax August figure remains pending. For more on the prospects for post Brexit britain see my following two in depth pieces of analysis that are likely to increasingly become manifest. And watch the following video of what actually happened on BrExit night that caught virtually ALL by surprise as illustrated by my selection of the highlights from 8 hours of BBC coverage of the EU Referendum result. 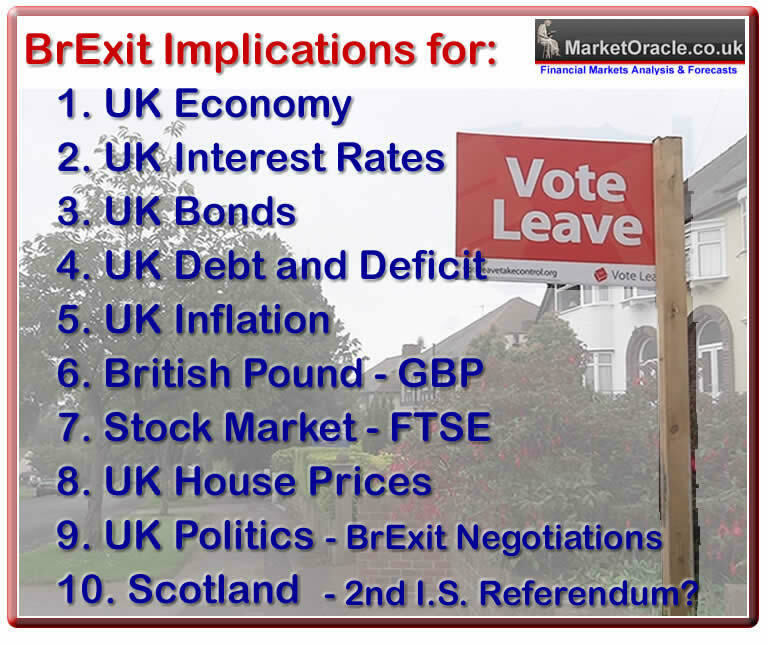 Also see the second video on trading markets during brexit night that illustrates how all hell broke lose once the polls closed Thursday 23rd June, triggering a sharp rally in sterling and FTSE futures that was sustained until the actual results started to be announced shortly after midnight triggering a 5 hour market panic.